Livigno is a ski holiday destination for you. This is a perfect destination if you are a winter sports lover or an adrenaline junkie. Here you can catch adrenaline snowboarding in the largest snowpark in Italy, trying paragliding or flying with helicopter. Livigno is also a place for entertainment in the city. Be astonished by beautiful typical Alpine houses, magnificent panoramic views and great winter activities. Livigno is a ski resort in Italian Alps close to border of Switzerland. The resort is located right in the heart of Alps and has a rich history. In history it was used as a pasture for shepherds and also as a vineyards for producing excellent Italian wine. Few decades ago, Livigno was a farming village, but in economic grow the village developed into modern ski resort. Tirano is the nearest train station to Livigno. But from Switzerland side the closest train station is Zernez. Snow Carbon is a good website for anyone looking to travel to the Alps by train. In developing our prices for transfers, we use a dynamic pricing systems to ensure our customer the lowest possible price for transfers to and from Livigno. To give you precise transfer price, we need to know several factors of your journey. We will do our best to provide you with reliable, cheap and fast Livigno transfers. All of the above will result only in base rate for your transfer going down. We never raise our prices for any reason at any time. We also offer great discounts for off-season and off-peak. If looking for a great deals, travelling in midweek and outside of peak season will result in big savings. Our midweek (Monday to Friday) prices with up to 60% discount that weekend prices. Your transfer price will also depend on transfer schedule, vehicle availability and utilisation and other costs, for example, road tolls and parking charges. 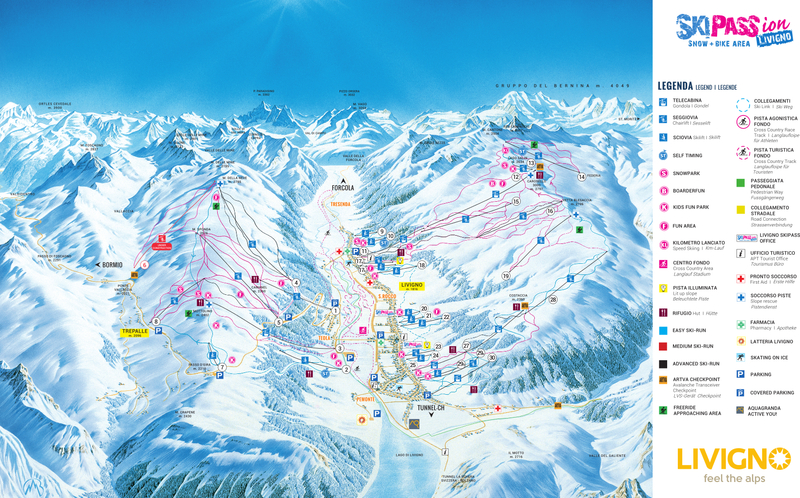 As mentioned before, the fact that Livigno makes up part of the Alta Valtellina ski area means more than 180 km of pistes and 62 ski lifts within easy reach. So even when you’ve tried all the rest has to offer, you’re never far away from a whole world of new experiences! Livigno is family friendly resort, which offer several facilities suitable for family with kids of all age. One of the great offers is Kindergarten Lupigno - it is a place for parents to leave their children for safe and fun entertainment, while they are enjoying winter sports. Here the child will have an opportunity to play in the indoor or outdoor area through games, fun and safety. Not to mention, a handful of outstanding ski schools for kids and adults of all ages. You need to tick a few boxes, when choosing to book transfers to and from Livigno. We offer reliability, punctuality and comfort complete with lowest price in the market. And how about vehicles that can get you where you’re going safely? Be sure to book your transfer early to get the best possible deal. Whenever your book with Alps2Alps, do not hesitate of the high-quality and low-cost of your transfer to Livigno. We are all about giving you the great start of your holiday - the moment you step on board!